With any sports or classic car it is vital that the suspension components are in perfect working condition and that everything is set-up correctly. Worn components or a less than optimal setup can ruin the ride of a car or at worst make the handling unpredictable. When it comes to racing having the correct setup can be the difference between between winning and the back of the pack. 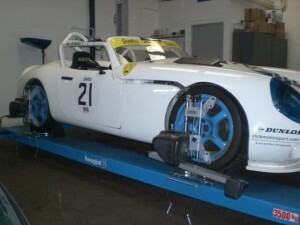 Here at Mat Smith Sportscars we not only have the experience to service and setup a cars suspension, we have also invested in state of the art equipment to help achieve the perfect setup. 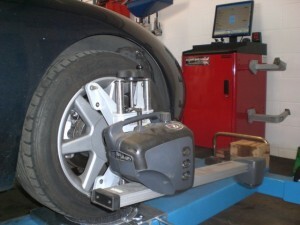 Used in conjunction with our 4 post lift and level floor we have full 4 wheel alignment with our Hunter alignment system and also corner weight scales. 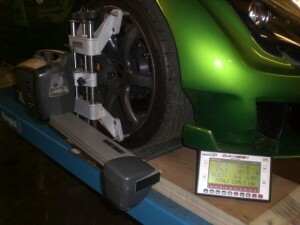 The 4-wheel alignment system allows us to repeatedly and accurately check the castor, camber, toe in/out, wheel set back etc to make sure the suspension is set to it optimum settings and also to make sure everything is square and pointing in the right direction, something you can’t always guarantee even on a factory fresh car. Using our equipment adjustments can be made, and then the whole car rechecked in case adjustments have had any knock on effects. 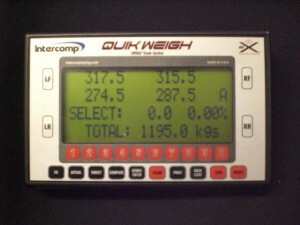 When setup is complete we can even print out the readings for you to check against next time. 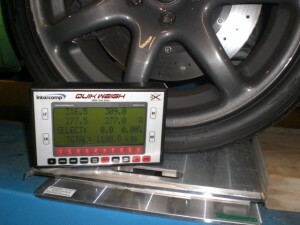 If your car has adjustable spring platforms or adjustable ride height, rather than simply setting the ride height, using our corner weight scales we can individually set each corner so that the car has the best balance. Ideally a car would have 25% of the weight on each corner. Usually unless its a mid engined car this isn’t possible but getting the same weight distribution on each side of the same axle, matching the cross corner weights will improve the cars, handling. If a car has more weight on one side than the other then the heavier side will have more grip when braking and accelerating. At best, this imbalance will make the car feel nervous and in the worst cases, will cause loss of traction or wheel lock up, setting the suspension up with the corner weights will eliminate these problems. Setting a car up in this way allows us to take into account the manufacturing tolerances in the suspension and chassis to achieve the best setup. As well as being able to correctly setup your cars suspension we are also agents for both Gaz and Nitron and can supply Springs and dampers to suit your taste and budget. We can then fit them and setup the car using our equipment.